An Assistant Treasurer takes charge of the treasury department of large organizations; the main job of these professionals includes analyzing the financial record of the company and assisting the Treasury heads to execute the Treasury management duties smoothly. 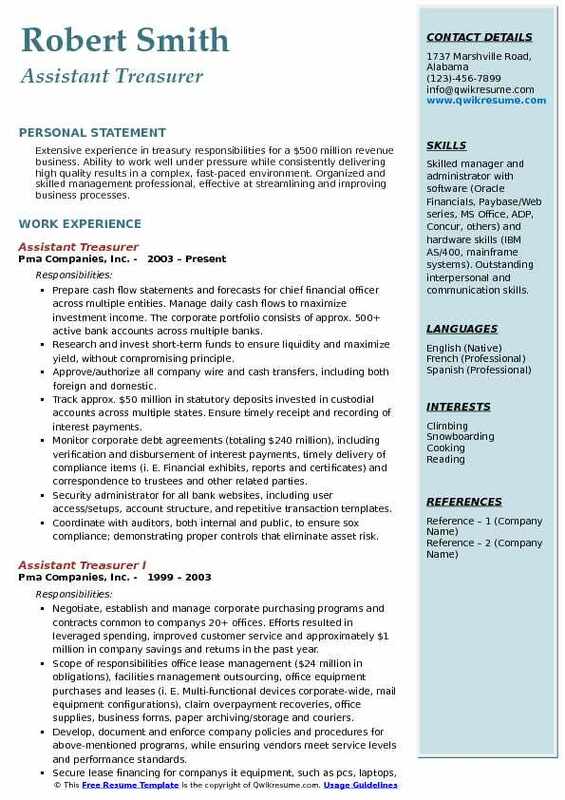 An Assistant Treasurer apart from assisting the treasurer completes the following duties – prepares the financial reports, monitors the budget, maintains all books of accounts, suggests better investment programs, updates financial records, manages payroll, makes financial recommendations, liaisons with lenders submits reports and implements relevant legislation and policies. 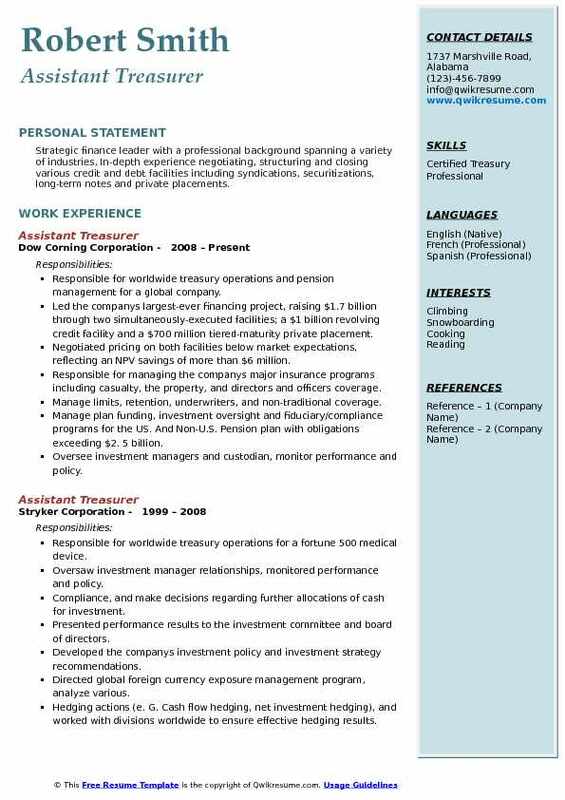 Candidates seeking to make a career as an Assistant Treasurer should demonstrate the following skills in the Assistant Treasurer Resume – hands-on experience in handling financial control, budgeting, passion for handling a huge number of numerical data/cash, proficiency in handling computers and latest office equipment. 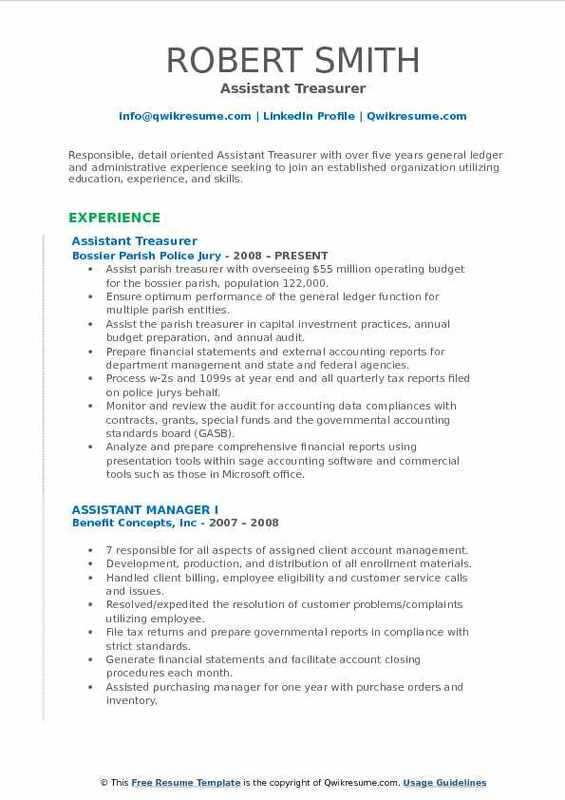 Any person with a degree in Finance or accounting with relevant professional experience can seek to become an Assistant Treasurer. Summary : A highly motivated and organized treasury professional who enjoys problem-solving and being a part of high volume functional teams. Skills : Cash management, bank reconciliations, and accounting. Manage over 5 billion dollars on deposit for the treasury department servicing over 1,000 trust and entity accounts. Oversee and monitor forty-four cash operating accounts, escrows, and money market mutual funds on a daily basis. Initiate and execute daily cash transactions, including wires, foreign wires, achs, checks, eft, EFTPS payments, foreign draft checks, cashiers checks, investments and redemptions for the treasury department. Confirm fed ref #s to clients and family members. Reconcile cash activity, record accounting entries for maturities, cash receipts, and cash disbursements on daily basis. Record interest from various accounts on monthly basis and document variances. Identify, analyze, and resolve daily cash errors made by accountants and senior accountants before posting entries. Post all cash related transactions such as journal entries, cash receipts, and cash disbursements followed by the day-end process. Coordinate the movement of cash, enter activity onto cash sheet to confirm daily balance, and assist cash director upon request. Track monthly bank fees, check deposits, positive pay, and sweeps on multiple accounts to ensure the accuracy of billing. Summary : Strategic finance leader with a professional background spanning a variety of industries, In-depth experience negotiating, structuring and closing various credit and debt facilities including syndications, securitizations, long-term notes and private placements. Responsible for worldwide treasury operations and pension management for a global company. Led the company's largest-ever financing project, raising $1.7 billion through two simultaneously-executed facilities; a $1 billion revolving credit facility and a $700 million tiered-maturity private placement. Negotiated pricing on both facilities below market expectations, reflecting an NPV savings of more than $6 million. Responsible for managing the company's major insurance programs including casualty, the property, and directors and officers coverage. Manage limits, retention, underwriters, and non-traditional coverage. Manage plan funding, investment oversight and fiduciary/compliance programs for the US. And Non-U.S. Pension plan with obligations exceeding $2. 5 billion. Oversee investment managers and custodian, monitor performance and policy. Plan administrator for medical, dental, life, ltd and 401k pension and savings plan. 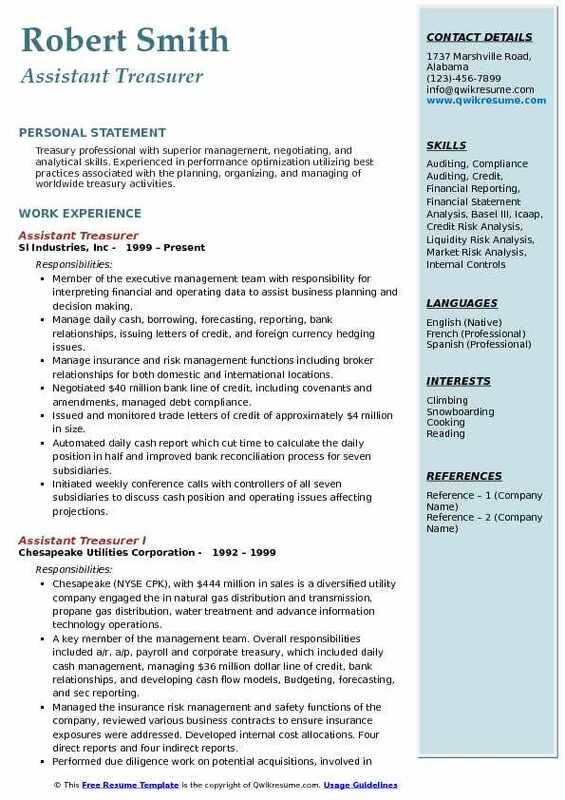 Team leader, and liaison with foreign locations, for coordination of monthly closing, which included journal entries, account analysis, financial reporting, and cash flow preparation. Summary : Extensive experience in treasury responsibilities for a $500 million revenue business. Ability to work well under pressure while consistently delivering high quality results in a complex, fast-paced environment. Organized and skilled management professional, effective at streamlining and improving business processes. 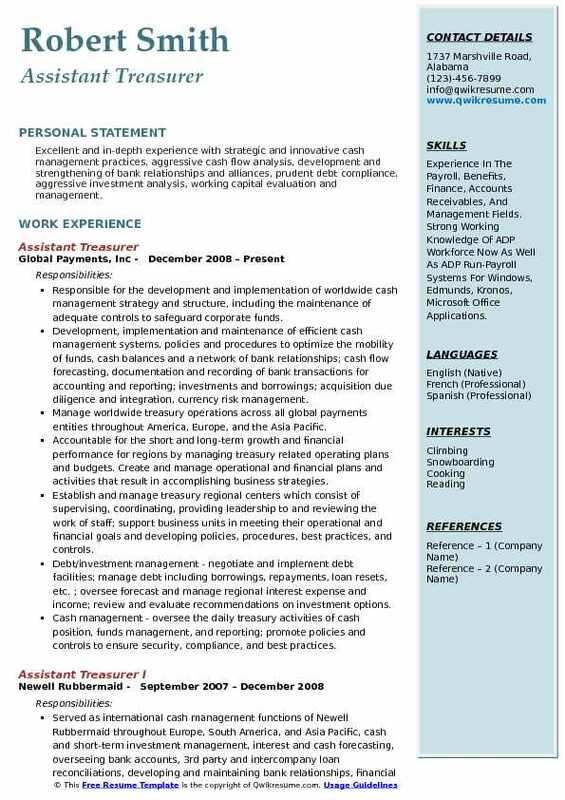 Skills : Skilled manager and administrator with software (Oracle Financials, Paybase/Web series, MS Office, ADP, Concur, others) and hardware skills (IBM AS/400, mainframe systems). Outstanding interpersonal and communication skills. Prepare cash flow statements and forecasts for chief financial officer across multiple entities. Manage daily cash flows to maximize investment income. The corporate portfolio consists of approx. 500+ active bank accounts across multiple banks. Research and invest short-term funds to ensure liquidity and maximize yield, without compromising principle. Approve/authorize all company wire and cash transfers, including both foreign and domestic. Track approx. $50 million in statutory deposits invested in custodial accounts across multiple states. Ensure timely receipt and recording of interest payments. Monitor corporate debt agreements (totaling $240 million), including verification and disbursement of interest payments, timely delivery of compliance items (i. E. Financial exhibits, reports and certificates) and correspondence to trustees and other related parties. Security administrator for all bank websites, including user access/setups, account structure, and repetitive transaction templates. Coordinate with auditors, both internal and public, to ensure sox compliance; demonstrating proper controls that eliminate asset risk. Handle administration of interest rate swap agreements with a notional value of $20 million. Review monthly bank fee statement analyses for accuracy with negotiated fee schedules. 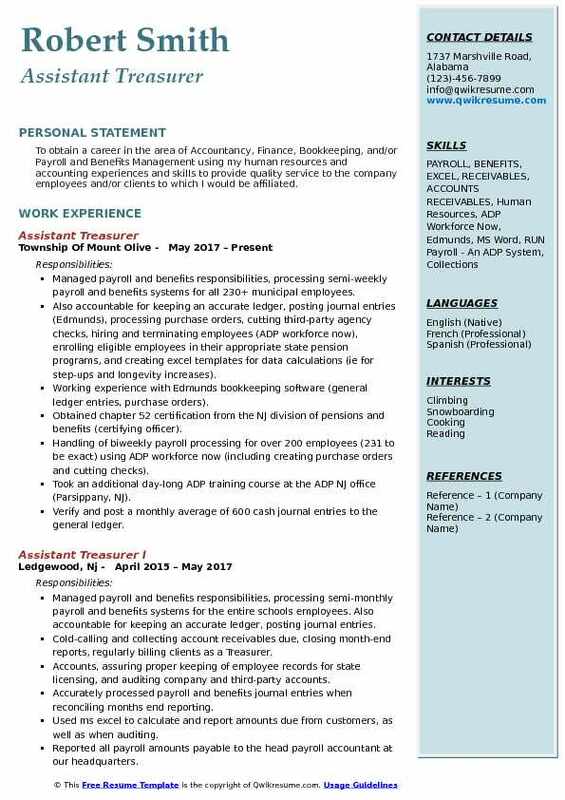 Objective : To obtain a career in the area of Accountancy, Finance, Bookkeeping, and/or Payroll and Benefits Management using my human resources and accounting experiences and skills to provide quality service to the company employees and/or clients to which I would be affiliated. Managed payroll and benefits responsibilities, processing semi-weekly payroll and benefits systems for all 230+ municipal employees. Also accountable for keeping an accurate ledger, posting journal entries (Edmunds), processing purchase orders, cutting third-party agency checks, hiring and terminating employees (ADP workforce now), enrolling eligible employees in their appropriate state pension programs, and creating excel templates for data calculations (ie: for step-ups and longevity increases). 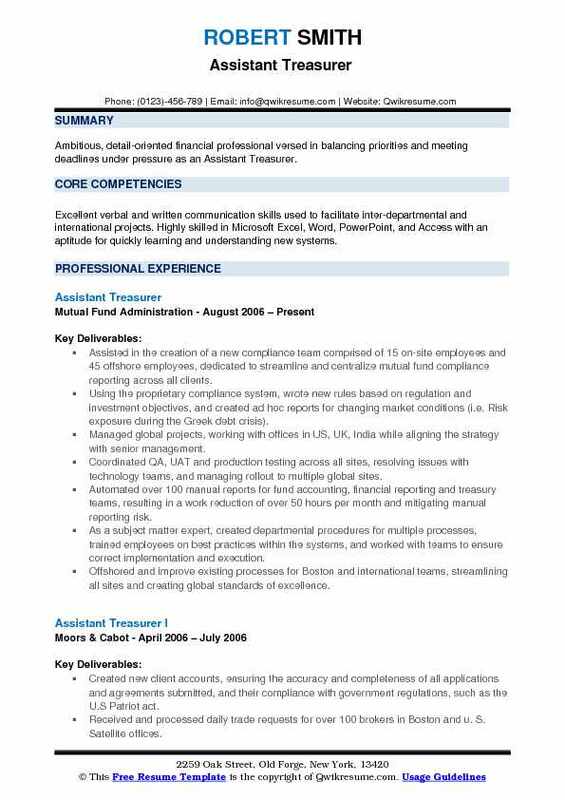 Working experience with Edmunds bookkeeping software (general ledger entries, purchase orders). Obtained chapter 52 certification from the NJ division of pensions and benefits (certifying officer). Handling of biweekly payroll processing for over 200 employees (231 to be exact) using ADP workforce now (including creating purchase orders and cutting checks). Took an additional day-long ADP training course at the ADP NJ office (Parsippany, NJ). Verify and post a monthly average of 600 cash journal entries to the general ledger. Track board of directors compensation program; ensure proper year-end tax reporting. Manage corporate payroll function, ensuring timely, semi-monthly payments to employees. Summary : Ambitious, detail-oriented financial professional versed in balancing priorities and meeting deadlines under pressure as an Assistant Treasurer. Skills : Excellent verbal and written communication skills used to facilitate inter-departmental and international projects. Highly skilled in Microsoft Excel, Word, PowerPoint, and Access with an aptitude for quickly learning and understanding new systems. Assisted in the creation of a new compliance team comprised of 15 on-site employees and 45 offshore employees, dedicated to streamline and centralize mutual fund compliance reporting across all clients. Using the proprietary compliance system, wrote new rules based on regulation and investment objectives, and created ad hoc reports for changing market conditions (i.e. Risk exposure during the Greek debt crisis). Managed global projects, working with offices in US, UK, India while aligning the strategy with senior management. Coordinated QA, UAT and production testing across all sites, resolving issues with technology teams, and managing rollout to multiple global sites. Automated over 100 manual reports for fund accounting, financial reporting and treasury teams, resulting in a work reduction of over 50 hours per month and mitigating manual reporting risk. As a subject matter expert, created departmental procedures for multiple processes, trained employees on best practices within the systems, and worked with teams to ensure correct implementation and execution. Offshored and improve existing processes for Boston and international teams, streamlining all sites and creating global standards of excellence. Worked with tax, financial reporting, and treasury to ensure adherence to regulatory guidelines and successful reporting during fiscal year end cycles. Summary : Excellent and in-depth experience with strategic and innovative cash management practices, aggressive cash flow analysis, development and strengthening of bank relationships and alliances, prudent debt compliance, aggressive investment analysis, working capital evaluation and management. 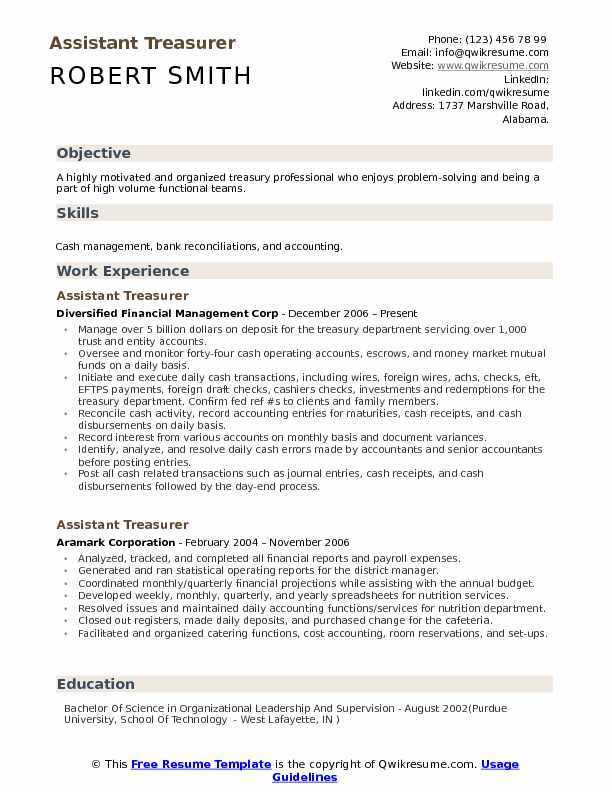 Skills : Experience In The Payroll, Benefits, Finance, Accounts Receivables, And Management Fields. Strong Working Knowledge Of ADP Workforce Now As Well As ADP Run-Payroll Systems For Windows, Edmunds, Kronos, Microsoft Office Applications. Responsible for the development and implementation of worldwide cash management strategy and structure, including the maintenance of adequate controls to safeguard corporate funds. Development, implementation and maintenance of efficient cash management systems, policies and procedures to optimize the mobility of funds, cash balances and a network of bank relationships; cash flow forecasting, documentation and recording of bank transactions for accounting and reporting; investments and borrowings; acquisition due diligence and integration, currency risk management. Manage worldwide treasury operations across all global payments entities throughout America, Europe, and the Asia Pacific. Accountable for the short and long-term growth and financial performance for regions by managing treasury related operating plans and budgets. Create and manage operational and financial plans and activities that result in accomplishing business strategies. Establish and manage treasury regional centers which consist of supervising, coordinating, providing leadership to and reviewing the work of staff; support business units in meeting their operational and financial goals and developing policies, procedures, best practices, and controls. Debt/investment management - negotiate and implement debt facilities; manage debt including borrowings, repayments, loan resets, etc. ; oversee forecast and manage regional interest expense and income; review and evaluate recommendations on investment options. Cash management - oversee the daily treasury activities of cash position, funds management, and reporting; promote policies and controls to ensure security, compliance, and best practices. Maximize use of cash and execute investment and/or borrowing decision. Oversee cash management banking and financial institution relationships. Negotiate bank and service fees. Implement new bank technologies, products and services to improve the cash cycle and simplify company operations; evaluate and approve the opening/closing of accounts worldwide. Consolidate and managed global cash flow forecast. Summary : A professional with a successful track record at publicly-traded and privately-held firms spanning multiple industries. Financial planning and analysis; Complex financial modeling; Corporate Treasury; Budgeting and forecasting. Works in a decentralized planning environment with over 30 operating units and corporate management to prepare monthly and quarterly forecasts, including extensive reporting and analysis using Hyperion Planning, Essbase, smart view and Microsoft Excel. Provides ongoing decision support and ad hoc analyses to corporate management work with subsidiaries to assist them in improving and streamlining their forecasts and plays a supporting role in the annual business plan. Implemented numerous improvements in process, analytics and reporting which have enhanced the accuracy, turn-around time and information content of the forecast. Directed successful project to improve visibility into the company's consolidated financial statement model (pl, balance sheet, and cash flow) used for eps guidance by splitting it into component models for the US, Canada, and Australia which flow into a single, unified consolidating model. Developed backlog roll process to improve the analysis and explanation of changes in backlog (the portion of the forecast committed under firm contracts). Identified and defined key components, built a preliminary model, tested with actual data, sought feedback and then incorporated all of this work into a single complex model containing the calculations necessary to "roll" backlog. Worked with the support team to create Hyperion planning accounts to facilitate the backlog roll process. The new accounts reduced the data points required to conduct the analysis by over 80%. 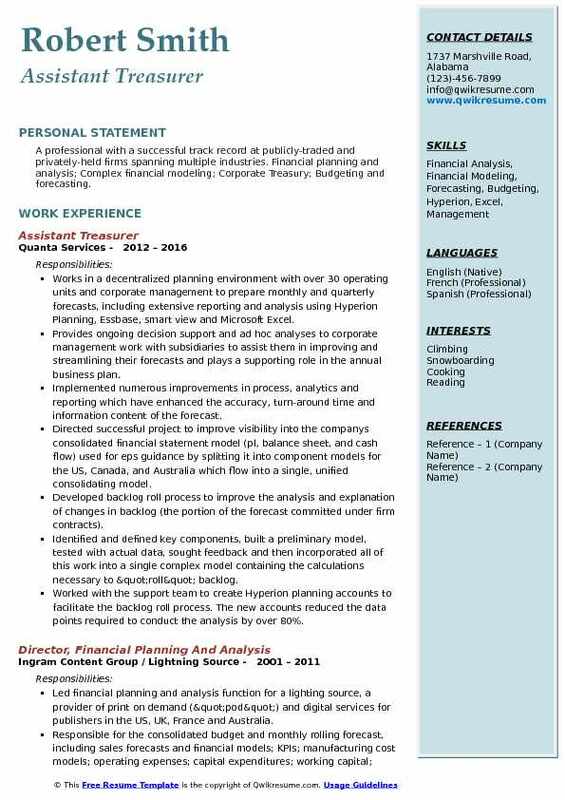 Summary : Experienced financial professional with extensive background in financial analysis and budgeting, treasury operations, financial reporting, general ledger and variance analysis. Provide direct supervision in the areas of cashiering, cash management functions, third party billing, student accounts and refunds. Provide direct supervision return check process and reconciliation, credit card merchant invoicing and petty cash processing and reimbursement. Provide interpretation and guidance to staff to ensure compliance with accounting and fiscal rules of federal, state and the university. Generate various financial reports which include transfer report, account receivables report and kpi report, via banner finance and other reporting tools, to other department heads. Update and maintain all internal policies and procedures for the treasurer's office. Interface and work collaboratively with numerous agencies, students and other constituencies of the university and unc system. Responsible for student account receivable to banner finance, cash management and refund reconciliation. Implemented a new cashiering system at the university for better processing. Responsible for auditing the travel of university employees and students to ensure that the guidelines were being followed set forth by the office of state budget management. Prepared journal entries to be posted to the general ledger to clear travel fund. Served as the main point of contact for university employees regarding questions about travel guidelines. Summary : Responsible, detail oriented Assistant Treasurer with over five years general ledger and administrative experience seeking to join an established organization utilizing education, experience, and skills. Assist parish treasurer with overseeing $55 million operating budget for the bossier parish, population 122,000. Ensure optimum performance of the general ledger function for multiple parish entities. Assist the parish treasurer in capital investment practices, annual budget preparation, and annual audit. Prepare financial statements and external accounting reports for department management and state and federal agencies. Process w-2s and 1099s at year end and all quarterly tax reports filed on police jury's behalf. Monitor and review the audit for accounting data compliances with contracts, grants, special funds and the governmental accounting standards board (GASB). Analyze and prepare comprehensive financial reports using presentation tools within sage accounting software and commercial tools such as those in Microsoft office. Assists with the coordination, preparation, and management of agency budget requests, justifications, and revisions. Maintain integrity of the general ledger, including the chart of accounts. 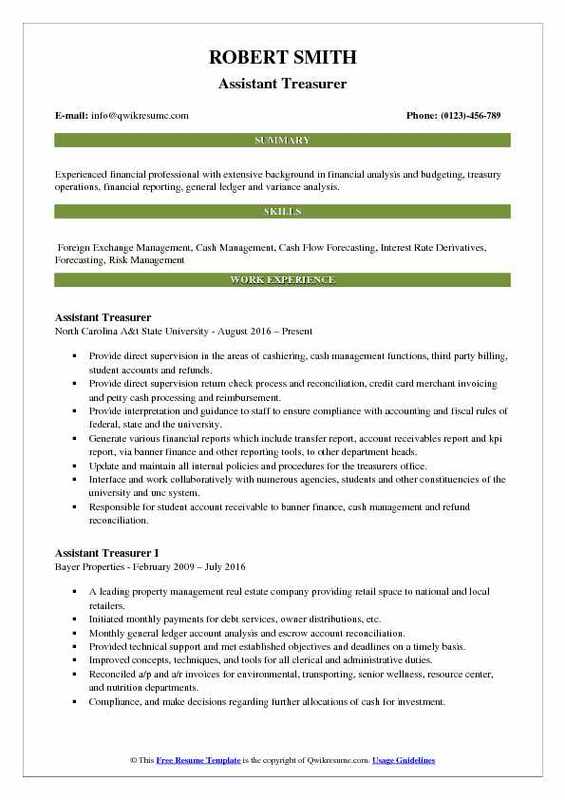 Summary : Treasury professional with superior management, negotiating, and analytical skills. Experienced in performance optimization utilizing best practices associated with the planning, organizing, and managing of worldwide treasury activities. Member of the executive management team with responsibility for interpreting financial and operating data to assist business planning and decision making. Manage daily cash, borrowing, forecasting, reporting, bank relationships, issuing letters of credit, and foreign currency hedging issues. Manage insurance and risk management functions including broker relationships for both domestic and international locations. Negotiated $40 million bank line of credit, including covenants and amendments, managed debt compliance. Issued and monitored trade letters of credit of approximately $4 million in size. Automated daily cash report which cut time to calculate the daily position in half and improved bank reconciliation process for seven subsidiaries. Initiated weekly conference calls with controllers of all seven subsidiaries to discuss cash position and operating issues affecting projections. Evaluated property coverage, achieving a 47% premium reduction through broker negotiations and tightening levels of exposure.